Greetings from Marta as tu Mika-Mysliwy, Brickbat Herald! This is the July 2002 internal Atenveldt Letter of Intent. It contains local submissions, asking questions of submitters and local heralds who have worked with them; if these questions are not addressed, the submission may be returned by the Atenveldt College of Heralds. You are welcome to comment both on submissions being considered for a future LoI and those already in an LoI; mistakes do get made, and I can correct ones, even on those submissions already at the Laurel level. Please have your comments to me 25 July. 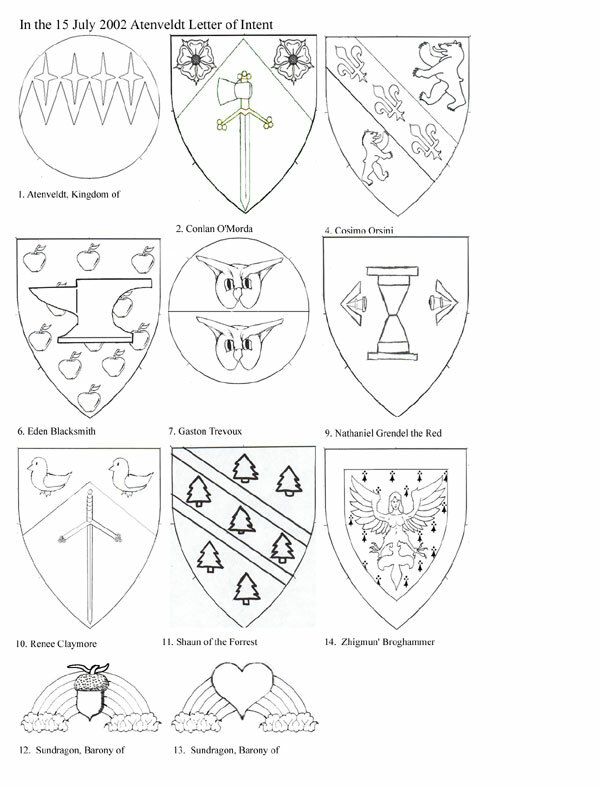 I accept online commentary, in addition to questions pertaining to heraldry: brickbat@nexiliscom.com. The Resubmission Push: please remember the little project to get our kingdom’s “lost souls” to make their free resubmissions! A list of these gentles dating back to 1997 is found on the Atenveldt Submissions website. If a submitter needs information (a replacement of his/her letter of return, suggestions for making a resubmission succeed), feel free to contact me. I have a grasp on Adobe Photoshop now, so sending you or a submitter a decent sketch of a new device or badge is easy to do. Consultation Table: there will be a Consultation Table (accepting submissions and resubmissions) at the Kingdom Arts and Sciences Competition in Tir Ysgithr on Saturday, 3 August. If you want to drag some reluctant submitters to it, feel free. If you’d like to volunteer some time there as well, consulting, learning or brushing up on your book armory skills, we’d love to see you there! Online Consulting: a few submissions from last month that had some problems (e.g., questions with name construction, armorial conflicts) were resolved over the last few weeks with my contacting the submitters directly via e-mail. I don’t want to step on the toes of you, the local heralds, and if I mention a problem in the body of this report, I’d really like you to contact the submitter as soon as possible to clear up these issues so that a submission isn’t delayed or ultimately returned at the kingdom level. If you feel that you are being slighted, or having an end-run done around you because I contact a submitter directly, please let me know. While I’m doing this to keep submissions moving, I don’t want to upset you. (The local heralds are the real workhorses for the kingdom, and unlike higher levels of the College of Heralds, all heraldic duties tend to drop into their laps–I need you, and I appreciate you!) To this end, if I contact one of your local submitters with a “problem” in his/her submission, should I copy you in on the email? Do you care one way or another? This isn’t a matter of who is or isn’t “doing the job,” only a means to keep submissions moving. If there is no email available for a submitter, if I hear nothing from the local herald concerning a change in the submission, the notification that I will send to the submitter is most likely to be a return of the submission, which is a complete stop/end of the submission process for it. Name Submissions: Please be aware that a submitter only needs to submit THREE sets of paperwork for a name submission now (one each for the local office, the kingdom office, and the Laurel office). REMEMBER that if the documentation for the name elements is taken from any of the sources mentioned in “Appendix H - Name Books That Do Not Require Photocopies to Laurel” of the Administrative Handbook of the College of Arms of the Society for Creative Anachronism, Inc., you only need to include the page number, title of source (and edition, if applicable), and author on the name submission form. No photocopies are needed for documentation for articles found in www.sca.org/heraldry, either, just the bibliographical not on the submission form. Appendix H can be found at http://www.sca.org/heraldry/laurel/admin.html. Letters of Acceptance and Return: Atenveldt submissions from the April 2002 College of Arms’ LoAR appear in this letter. These are the submissions found in the December 2001 Atenveldt LoI. Submissions Website: You can send electronic commentary on the most recent internal LoIs through the site, in addition to any questions you might have. Current submission forms can be found there. Please let your local populace know about it: atensubmissions.nexiliscom.com. Per fess indented azure and argent, in chief four mullets of four points elongated palewise in fess Or. The name was reaffirmed in August 1979. This badge will be associated with activities of the Estrella War. While the mullets seem a little tight against the line of division, this is primarily to accommodate the badge form; they will likely move “up” on square and rectangular banners. Per chevron argent and vert, two roses azure and a claymore inverted proper maintained by a gauntlet fesswise reversed argent. See commentary on his name in the 1 June 2002 ILOI. While we aren’t sure of his derivation of the name, we are willing to send it up as is and see what the CoA has to say about it. The original submission, Vert, a claymore inverted proper gripped by gauntlet fesswise reversed argent., had multiple conflicts. Dividing the field and adding a group of coprimaries has appeared to resolve those. Argent, on a bend vert between two brown bears combattant proper three fleurs-de-lys Or. The name appears in the 1 March 2002 Atenveldt LoI. His original submission, Argent, on a bend vert between two brown bears passant proper three fleurs-de-lys Or., also appears in that LoI, and it is hereby withdrawn from consideration. The submitter wants to change the postures of the bears. Or, semy of apples gules, slipped and leaved vert, a single-horned anvil sable. The name is English. Eden is found in the Poll Tax 1379 as a variant of the feminine given name Edith (Withycombe, p. 93). Blacksmith is an occupational byname; Reaney and Wilson tend to connote the English surname Smith as meaning “farrier, blacksmith,” although Blacksmith itself seems acceptable as a byname (a Redsmythe, denoting a worker in copper or brass, was registered in November 2001). Per fess vert and sable, in pale two owls’ heads cabossed argent. The name was registered October 2000. The original submission (Per fess vert and sable, an owl’s head cabossed argent.) was in conflict. This use of two heads clears the conflict. Argent, an hourglass between in fess two pheons, points outward, gules. The name is German and English. First submitted as Grendel the Red, a given name was lacking. He is using his legal given name (I attest to seeing his driver’s license); Nathaniel is a Biblical name, the name of one of Christ’s apostles, although that fellow is more known as Bartholomew (Withycombe, p. 226). Grendel is cited in Bahlow, undated and more commonly spelled Grindel. This is a very old term for a moor or a swamp (it also refers to the swamp-monster Grendel in Beowulf). In the Hamburg region, more recent bynames include Grindelhof, Grindeltal, and Grindelburg. Grindel appears to be dated to 1215 in Brabant (p. 188, Bahlow), so it seems he could have the name (more likely with the spelling of Grindel than Grendel). The byname is a descriptive epithet. Per chevron azure and argent, two martlets and a claymore inverted counterchanged. Submitted as Renée ferch Claymore, this didn’t follow standard Welsh naming practices. She is dropping the very Welsh element ferch. Renée is the feminine form of the French given name René (Withycombe, p. 251), the name of a Bishop of Angers c. 426; it is also her legal middle name. Claymore comes from Deaton Claymore, the head of the household with whom the lady is affiliated; His Grace has provided a letter of permission to use that element of his registered name. Argent, semy of pine trees proper, two bendlets azure. The name was registered April 1999. The original submission, Argent semy of pine trees couped vert., was returned for conflict with Allendale of the Evergreens, Argent, a pine tree proper. There's one CD for the number of trees but no difference for changing less than half the tincture of the trees (the tincture of the tree trunk) from vert to wood-brown. Adding the bendlets creates a second CD for the addition of a co-primary group. As drawn, a more convoluted blazon could be made: Argent, between two bendlets azure between four pine trees, two, and two, proper, three pine trees proper. The given blazon is much neater. (fieldless) A rainbow gules, argent, azure, Or and purpure, clouded azure surmounted by a heart gules. The name was registered August 1983. (fieldless) A rainbow gules, argent, azure, Or and purpure, clouded azure surmounted by a sprouted acorn proper. Erminois, a Caucasian harpy displayed proper, crined and feathered sable. The name was registered March 2000. The original submission (Azure, ermined Or, a pall argent surmounted by a Caucasian harpy displayed proper, crined and feathered sable.) had problems with tincture, with the mostly sable monster lying on the mostly azure field. A reworking of the tinctures has solved this problem. Azure, a seahorse within an orle Or. This is in conflict with Kateline Deveraux Simpson: Azure, a seahorse erect and a chief Or. There is only 1 CD for changing the type of secondary charge. She might wish to consider a divided field or a semy on the field to achieve the second CD; such changes would have to be checked for conflict. Edward Archer of Cornwall. Name change from holding name Edward of Atenveldt. Iðunn Sveinsdóttir. Name and device. Ermine, a pomegranate gules slipped and leaved vert and a bordure per saltire sable and purpure. Submitted as Idonea Svensdöttir, the submitter requested authenticity for Old Norse and allowed any changes. Svensdöttir was documented from a Web article not on the Laurel website. As such, printouts are required as documentation. Since printouts were not included, this documentation is not sufficient for registration. In any case, the Old Norse form of this byname is Sveinsdóttir. We have changed the byname to this form per the submitter's request for authenticity. Idonea is a Latin form of a 12th to 14th C English given name derived from the Old Norse Iðunn (listed in Geirr Bassi, p. 12). An authentic name for a time period appropriate for Old Norse would have been rendered all in Old Norse or all in a Latinized form depending upon the language of the document in which the name was recorded. Gösta Tengvik, Old English Bynames, dates Eduuardus filius Suani to 1066 on p. 198. Iðunn Sveinsdóttir would be a completely Old Norse form of this name. Idonea filia Suani would be a completely Latinized form of this name. As the submitter requested authenticity for Old Norse, we have changed this name to the form Iðunn Sveinsdóttir to comply with her request. Killian M'Cahall. Badge. (Fieldless) A dragon sejant contourny barry engrailed vert and Or. There were some concerns in the College that the engrailing would not be identifiable due to the complex outline of the charge and the internal details. The full-sized colored emblazon shows that the engrailing is very obvious. This barry engrailed monster is at most one step from period practice, since animate charges in multiply divided tinctures were found in period armory. One of the most famous examples is that of the arms of Hesse, Azure, a lion rampant queue-forchy barruly argent and gules crowned Or. Siebmacher's 1605 Wappenbuch gives a number of other examples, including Truchess von Wellerswalde, Azure, an eagle displayed barry argent and gules (f. 161), Schirau, Azure, a unicorn rampant bendy gules and argent (f. 69) and Badendorf, Azure, a lion lozengy argent and gules crowned Or (f. 179). Dévora Risée de Apors. Badge. (Fieldless) A raven regardant azure. Conflict with Reginleif Ragnarsdottir, Or chape gules, a raven azure. There is one CD for fieldlessness. There is no other difference for changing only the head posture of the raven by RfS X.4.h, which states in part: "Changes in the position of the head, for instance, are not significant". Hawk's Rest, Shire of. Branch name and device. Or, a tower sable charged with a hawk's head erased Or environed in base with a laurel wreath vert. No documentation was presented and none was found that Rest is a plausible toponymic element in a period English placename. The LoI stated that "[a] rest is a stopping place, or a lodging place, as for travelers or pilgrims, according to the Compact Oxford English Dictionary". Ferrule noted that the COED (p. 544) dates this use of rest to 1225. However, evidence that a word existed in English in period is not documentation that it is a plausible element in an English placename. As no member of the College could find any evidence that Rest was used as a toponymic in an English placename, it is not registerable in that use. Rest has only been registered as a toponymic element a total of seventeen times (not including holding names based on a registered branch name). The most recent registration was of Household Stone's Rest (registered October 1998). The next most recent registration was in 1992. Therefore, the element Rest does not have the same level of popularity as elements that have been ruled SCA-compatible as toponymics in placenames, including Keep. Lacking such continuous popularity, this element is not SCA compatible. There are two differences between the elements Keep and -crest, which are SCA compatible, and Rest, which is not. As discussed in the November 2001 LoAR (s.n. Tristan Ravencrest), there are examples of period bynames that use forms of keep and crest, including Rogerus del Crest which Bardsley (p. 216 s.n. Crest) dates to 1379, and Thomas ate Kepe which Reaney & Wilson (p. 261 s.n. Keep) date to 1327. No bynames of this form have been found using a form of rest. Also, Keep and -crest have been more popular in recent years than Rest. It is these two main factors which grant Keep and -crest the benefit of the doubt and make them SCA compatible, where Rest is not. Ekwall (pp. 226-227) lists some placenames that include references to 'hawk' as their first element, including Hauxley, Hawkedon, Hawkhill, Hawkinge, Hawkley, Hawkridge, Hawkstone, and Hawkwell. These headers give examples of words meaning 'hawk' combined with a variety of toponymics and would provide examples of constructions that occured in period. The appropriate designator is Shire rather than Incipient Shire, as the College does not track this status. The device must be returned for lack of a name to which to register it. The armory had an additional problem which would not allow it to be accepted. Laurel wreaths should not be drawn with another charge between the tips of the wreath, except possibly when the charge between the tips is very thin. "[A laurel wreath and in chief a roundel] Second, the laurel wreath is not closed (or even nearly so), and if it were, there would be no room for a roundel. A properly drawn laurel wreath should not have sufficient room between its tips to place another charge"(LoAR 2/00). Bahlow, Hans. Deutsches Namenlexicon. 1967. Black, George F. The Surnames of Scotland. The New York Public Library Press, NY. Ó Corráin, Donnchadh and Fidelma Maguire. Irish Names. The Lilliput Press, Dublin, 1990. MacLysaght, E. The Surnames of Ireland. Dublin, Irish Academic Press, 1991. Morgan, T. J. and Prys Morgan. Welsh Surnames. Cardiff, University of Wales Press, 1985. Reaney, P.H. and R. M. Wilson. A Dictionary of English Surnames, 2nd Edition, 1976 (reprinted 1979). Withycombe, E.G., The Oxford Dictionary of English Christian Names, 3rd Edition. London, Oxford University Press, 1977.